More HRT action happening at Lindy J Quilts! If you haven’t worked with Half RECTANGLE Triangles, we have created a new pattern that introduces you HRT’s! HRT’s are so versatile and fun, but they can be a little tricky to sew. 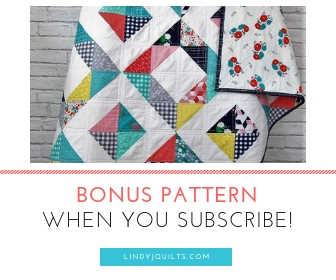 But don’t let that scare you away from this fun quilt pattern! We re-created our popular low-volume-ish Auburn baby quilt to show you how we cut and sew our HRT’s. Our Auburn baby quilt is so much fun to put together! Auburn’s HRT’s are 3” x 6” so that means a lot of cutting, sewing, and pressing. But that’s the way the process works and we enjoy all of it! For our Auburn Quilt, we used the same binding and backing: Lori Holt’s Vintage Happy in Floral by Riley Blake. This fabric has a lovely blend of navy, orange, and white – perfect for a baby quilt and perfect for the color palette inspiration for our patchwork units. For our fabric selection, we dove into our stash for some low volume orange and blues. But we threw in pops of solid orange and blues here and there to break up the low volume-ness of the quilt. You will find small-scale florals, geometric prints, and even an animal or two in this sweet quilt. For the quilting, we stuck with simple quilting in the ditch of all the units’ seams. We debated adding more quilting, but this quilt didn’t need it. We didn’t want to make it too busy with excessive quilting. We also wanted to let our orange and blues shine on their own. The quilting is just right and it give the quilt a beautiful drape and feel. We used light-weight batting from Warm & Company, so the quilt is warm, but not too heavy. Ready to try a HRT quilt? Well, we are so excited to add this pattern to our shop! The Auburn HRT Quilt Pattern is the perfect introduction to HRT’s and when you’re feeling confident in the HRT process, you should try out our Della’s Diamonds Quilt Pattern and our Susi’s Boy Herringbone Quilt Pattern. They too use the HRT’s, but those quilt patterns require slightly different cutting and layout strategies. Our patterns walk you through each step so that you will be an HRT expert in no time! Of course you do need a special ruler for your HRT’s. We LOVE the Creative Grids Half Rectangle Ruler. But definitely get the No-Slip Grips as an add-on. Those little grippers save the day when cutting 200+ HRT’s! There are a lot of ways to creat HRT units, but we’ve found using the ruler for individual HRT’s gives us the most accurate unit. Our HRT’s sew up beautifully and we end up with a perfectly straight quilt top. Our Auburn Baby Quilt is available in our shop. This quilt is so modern, sophisticated, and cheerful – perfect for a baby and toddler. Thank you for stopping by our blog and seeing what we are up to! We have a couple custom order baby quilts in the works and we can’t wait to show you those beauties! Do you have an HRT tips of the trade? Leave a comment below! P.S. Our post contains affiliate links. Next Post Spring Pattern SALE!